Julia Salinas of LA FEM harvests ripe coffee cherries in Nicaragua. Photo by Julia Baumgartner for Cafe Campesino. September 2012. 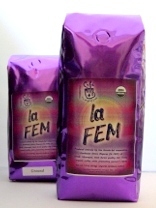 La Fundacion Entre Mujeres is a well organized all-women’s NGO in northern Nicaragua that is committed to selling quality, Fair Trade coffee while simultaneously supporting the ideological, economic, and political empowerment of rural women. La FEM supports female empowerment through a variety of projects that include an education program that promotes literacy; a gender equality-focus in primary and secondary schools; education in alternative careers (such as sustainable development); the promotion of sexual and reproductive rights; access to health services for women; a community network of rural defenders that help stop violence; diversified and organic food production and a strategy for the economic empowerment of women. All projects are carried out under a focus of sustainable economic development for the adults and youth that these programs reach. Through such programs, women from the rural communities are able to participate and be real actors in transforming their own realities, making decisions in the development politics carried out by la FEM. La FEM began in 1995 when director Diana Martinez began to organize women from rural communities in the north of Nicaragua. The initial focus of the organization was to create an autonomous space for rural women that would challenge the traditional, male-dominated model of rural development and to promote women’s rights. Access to land has always been a key aspect of FEM’s proposal, allowing women to be autonomous and individual subjects of their own development. With that, comes the need to provide adequate access to development resources such as credit, seeds, alternative technologies, infrastructure, and markets. With an overarching feminist vision, FEM participates actively in the larger Feminist Movement of Nicaragua and promotes raising consciousness on the rights of women. 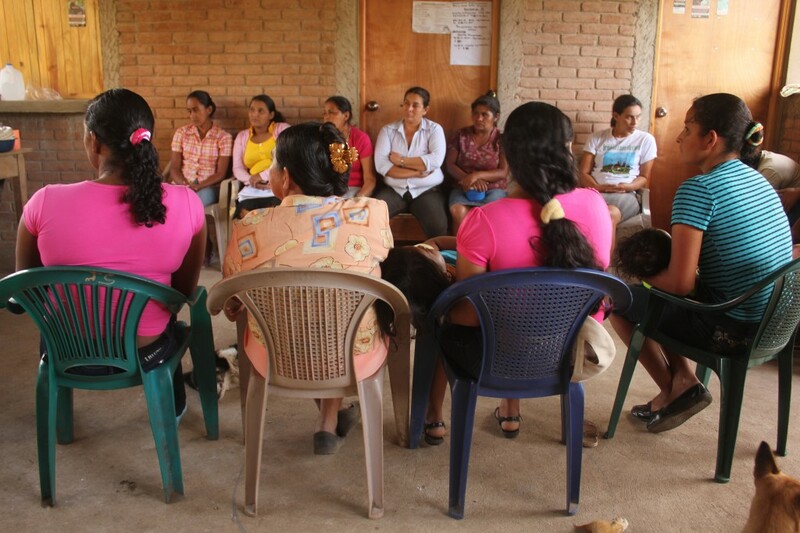 A meeting of women in Communidad El Colorado who are benefiting from the rebuilding project. Photo by Julia Baumgartner. September 2012. 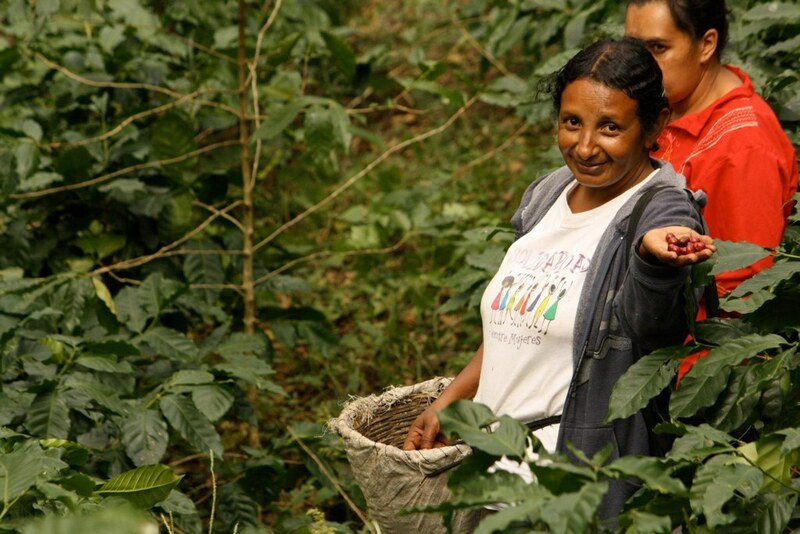 Under the larger umbrella organization of La FEM are six smaller cooperatives scattered throughout the northern region of Nicaragua, which groups together around 150 women coffee farmers. 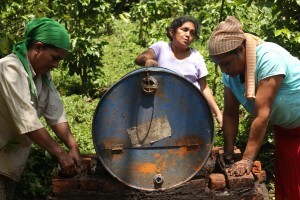 These women are cultivating a total of 164 manzanas of land (about 284 acres) that focus on organic coffee production. Through their connection with La FEM, women farmers have access to trainings that will help them improve their coffee production. At a centralized location, women also have access to a large nursery full of 80,000 healthy, new, organic plants as well as organic fertilizers made with recycled materials from the nearby farms, as well as a coffee roaster and cupping lab. Each of the cooperatives contains a wet mill, where coffee is depulped before it is sent to a nearby processing facility to be dried on patios, milled, and exported. Focusing on alternative markets and being educated on the entire production chain, FEM sells their products both locally in Esteli as well as internationally. All local products are marketed under the label “Las Diosas” (goddess in English), with a symbol that represents the moon and the rain together with the women’s symbol. FEM has operated for over 15 years as an NGO, but has strives to make the cooperatives more independent from their organization, empowering women farmers so they manage not only production, but also the commercialization of their products. After years in the making, the dream of a secondary-level cooperative or a central location to organize the cooperatives and offer services is finally coming through. This effort is more important than ever now that NGOs in Central America are being hit hard by the economic crisis in Europe, which had been a resource for many NGO-led projects in the country. Especially here in Nicaragua, many NGO’s were formed in the ’90s as a response to the new neoliberal government’s defeat over the Sandinistas. Services were quickly privatized during that time, causing a surge in NGOs that came about to offer basic services to Nicaraguans. Since then, Nicaragua has counted on a steady income of financing or cooperation for development projects from Europe. These days, NGOs are seeing their support dwindling from European organizations, as their economics continue to go downhill. Many NGO’s are feeling the hit and are being forced to close down or are looking for alternatives to continue to support the communities they have been working with. FEM’s response is to organize a secondary-level cooperative with the idea of improving facilities that already exist nearby, housing a coffee plant nursery, organic fertilizer facility, and cupping lab. The women are working to invest their social premiums from coffee sales into the development of this larger cooperative and continue to use the skills they have acquired through la FEM to work even more directly with their buyers as well as to improve production levels. The cooperatives will continue to diversify both their incomes and their food supply, not only focusing on coffee, but also the production of hibiscus flower (for wine, jams, and tea), basic grains, vegetables, and milk production. A small group of women have also been working on constructing sustainable ovens so that women can bake whole grain bread for their families and to sell at local markets. Rosibel, Lilian and Veronica of the LA FEM cooperative are working on sustainable ovens that they will use to bake bread to sell in their local village in Nicaragua. By having access to their own parcels of land while also participating in the Fair Trade market, women organized under La FEM have seen dramatic changes in their lives. This organization not only helps women to increase their household incomes, but it is also changes the culture of each of the communities that it reaches. By allowing women to be subjects rather than objects of their own development, they feel more empowered economically and thus are able to have more ownership over their work. Women are no longer solely dependent on partners who may not treat them well, and with their economic independence, are more likely to leave an unhealthy relationship. With their own incomes they can be more autonomous in their decision-making and benefit from an improved self-esteem. Women who have been active with la FEM have said that they have had increased confidence-levels, because they have had a comfortable space to share their opinions and ideas. This confidence has translated also into areas outside of la FEM, into public spaces such as town hall meetings or inside their homes. Daughters of these women are also beginning to think differently. They are the fruits of all of their mothers’ efforts and have learned to be more confident in their opinions and more aware of their rights as women. There’s no doubt that this work is changing the culture in which they live. As long as consumers in the United States continue to consume their coffee, women will feel motivated to continue to move forward with better prices to invest more in their farms. Their hope is to receive higher prices to improve not only the quality of our product, but the quality of their lives as women. Connections with buyers in the US have helped farmers gain access to new information through farmer exchanges and encounters with consumers to better understand Fair Trade from both sides of the market, and also to feel that they are not alone in their struggle. Article written for Cafe Campesino by Julia Baumgartner, who is living and working with LA FEM .